A robot wolf designed to protect farms has proved to be such a success in trials that it is going into mass production next month. 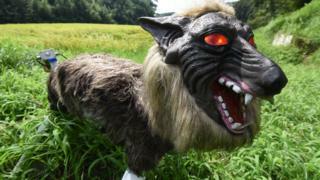 The "Super Monster Wolf" is a 65cm-long, 50cm-tall robot animal covered with realistic-looking fur, featuring huge white fangs and flashing red eyes, Asahi Television reports. It's been designed to keep wild boar away from rice and chestnut crops, and was deployed on a trial basis near Kisarazu City in Japan's eastern Chiba prefecture last July.